Van Heflin in Week-End with Father (1951). 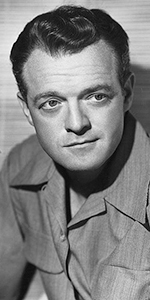 Van Heflin was a popular supporting player, and occassional lead, who benefitted from appearing in Shane, after which his acting in films was in great demand. Born to an Irish dentist father, and a French mother, Heflin went to high school in Oklahoma City. Van's sister Frances would go into the acting game was well, originating several roles in well-known plays before settling down to play Erica Kane's mother on the soap opera All My Children. Heflin attended the University of Oklahoma, then got his master's degree in acting from Yale University. Heading for Broadway, he made his debut appeared in Mr. Moneypenny (with Donald Meek playing his father) during the 1928 season. Taking a break for several years, he again graced Broadway with The Bride of Torozko in September, 1934, then The Night Remembers in November, 1934. He did a pair of plays on the Great White Way in 1936: Mid-West in January, and End of Summer from February to June. Signed to an acting contract at R-K-O, Heflin made his first film with Katherine Hepburn: A Woman Rebels (released in November, 1936). Heflin returned to Broadway for Western Waters in 1937, then appeared in Casey Jones under Elia Kazan's direction in February, 1938. When Katerine Hepburn was mounting her production of The Philadelphia Story (which ran for an entire year on Broadway), she chose Heflin to create the role of Mccauley O'Connor, which is the role James Stewart played in the movie version (and which played the Chinese in December, 1940). Suddenly, what was good enough for Hepburn was good enough for M-G-M; they signed Heflin to a contract and immediately loaned him out to Warners for Santa Fe Trail (released in December, 1940), then gave him a supporting role in Johnny Eager (which played the Chinese in March, 1942). Heflin won an Oscar for this film. Heflin played president Andrew Johnson in Tennessee Johnson (played the Chinese in April, 1943). He co-starred with Judy Garland in Presenting Lily Mars (played the Chinese in July, 1943), before shipping out to serve as a combat cameraman with the Ninth Air Force in Europe and the First Motion Picture Unit, under Jack L. Warner. Returning from the war, Heflin resumed his solid performances in various films: Till the Clouds Roll By (released in January, 1946); he played Athos to Gene Kelly's D'Artagnan in The Three Musketeers (released in October, 1948); and played the husband of Jennifer Jones playing in the title role of Madame Bovary (released in August, 1949). Switching to independent contracting, Heflin made The Prowler (released in May, 1951) for producer Sam Speigel. He had been cast as rancher Joe Starrett in Shane (which played the Chinese in June, 1953), but it was so long in post-production, that when the film finally came out and was a smash hit, it suprised the actor; he had sort of forgotten about it. Suddenly, he was a hot commodity. Producer Charles Brackett put Heflin in a romantic lead in Woman's World at Fox. On opening day at the Chinese, Heflin made his footprints in the Forecourt. Heflin starred on Broadway in A View from the Bridge / A Memory of Two Mondays with Martin Ritt directing, from September, 1955 to February, 1956. He them starred in the classic western 3:10 to Yuma (released in September, 1957). Heflin starred on Broadway as a trial lawyer in A Case of Libel for 242 perfs from October, 1963 to May, 1964. He took a role in The Greatest Story Ever Told (released in February, 1965). He starred in the remake of Stagecoach (released in June, 1966), then reprised his Broadway role in a television movie version of A Case of Libel, which ran on ABC in February, 1968. His last theatrical film was playing the nut case in Airport (released in March, 1970). While swimming in June of 1971, Heflin suffered a heart attack. Rushed to the hospital, he remained in a coma for six weeks before his heart gave out. Upon his instructions, there was no funeral, with his ashes scattered in the ocean. He was 62 years old. Grauman's Chinese Theatre, Hollywood, California. 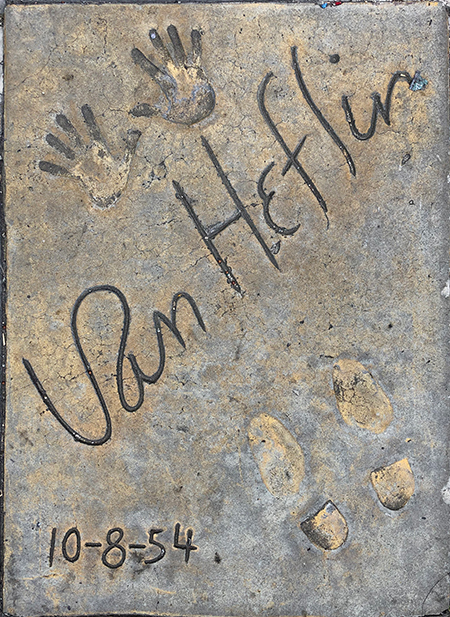 Van Heflin Forecourt ceremony, Friday, October 8, 1954. 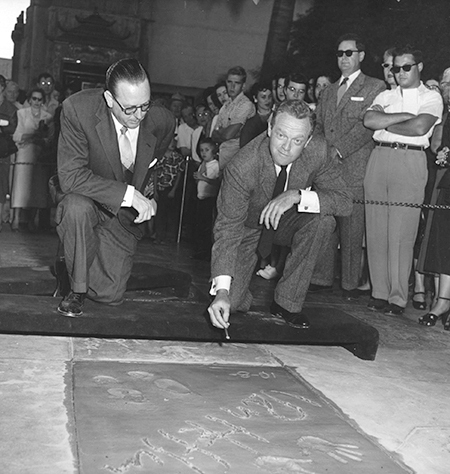 Fox West Coast Theatres executive Edwin F. Zabel looks on as Van Heflin makes his mark in the cement.